Meant to Be Mine by Becky Wade is a sort of Cinderella story with a twist. Both of the main characters need rescuing, but neither realizes it at first. Celia and Ty knew each other briefly as teens, and then spontaneously had a Vegas wedding after meeting back up years later. Regretfully the morning after, Ty breaks Celia's heart as reality crashes in on them both. After some years pass, Ty reenters Celia's life, and finds a surprising turn of events. After many attempts at trying to fix things themselves, Ty and Celia ultimately come to realize that they both need a "prince charming" to rescue them -- God. 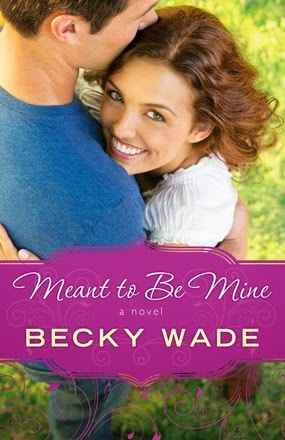 Becky Wade tells a compelling page-turner, and Meant to Be Mine is surprisingly different from many "Christian romance" novels. The characters are not stereotyped in the sense that they are too good to be true.The main characters both have flaws, struggles, and hearts that need to be opened. Forgiveness is a major theme in the book, and Celia and Ty both have to reaffirm their faith in God and learn to rely on him to guide them. The background characters are interesting and add depth to the story. I'd love to see some spin off books developing these characters further, especially Jake, who is dealing with PTSD after returning home from the war. I especially like the different perspectives as the author describes both Celia's and Ty's thoughts and feelings throughout the book. Plus, there is a little steaminess as the chemistry between them builds. I was rooting for them the whole time, and could not wait to see where the story would lead. Becky Wade kept me guessing, though, with a few twists and surprises. If you're looking for a fun summer read, be sure to add this to your list. You won't be able to put it down!